This system could be used to monitor selected environmental parameters like temperature, illumination, relative humidity, atmospheric pressure for the proper growth of plants in green houses. Relay module is used to control electrical loads (irrigation pumps, heaters, lamps and automated windows). Automation allows greenhouse owners to focus on growing the plants. The main goal of this project was to develop a system that would test the network of sensors and actuators. Management of this system is provided by a mobile device (e.g. a Smartphone). It is connected to the Mesh network through a hybrid router. The idea is presented in the above diagram. Elements of the system communicate with each other using Wireless Thread network protocol. Each of the clients of the mesh network is based on NXP MKW24D512 Kinetis Wireless MCU. The NXP FRDM-KW24D boards and Arduino Shields has been used to test the software and communication between elements of the system. Program code for FRDM-KW24D boards has been written using Kinetis MKW2xD and MCR20A Connectivity Software. It has been compiled in Kinetis Design Studio IDE. The FRDM-KW24D board connectors are compatible with Arduino Headers. Various type of additional shields, sensors and actuators have been attached to FRDM-KW24D boards. 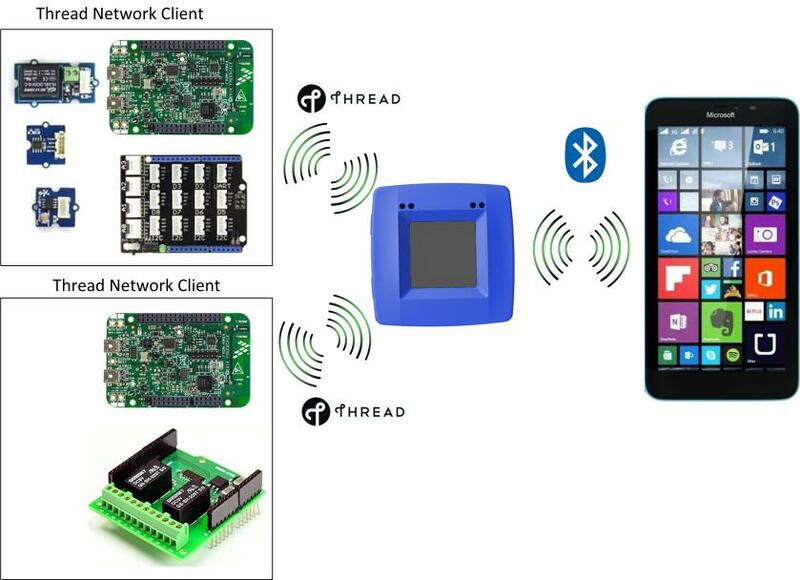 Data is sent to the NXP’s Rapid IoT Prototyping Kit though wirelles connection using Thread protocol. The NXP Rapid IoT Prototyping Kit has a KW41Z Wireless MCU and integrate a Bluetooth Low Energy 4.2, Generic FSK and 802.15.4 compliant modem. The KW41Z works as a hybrid BLE - Thread wireless router. This microcontroller can control environmental parameters and keep them within given limits using actuators. Firmware for the KW41Z MCU has been written in C using SDK for KW41Z and MCUXpresso IDE. User can manage the system using BLE Terminal in IoT Toolbox application.